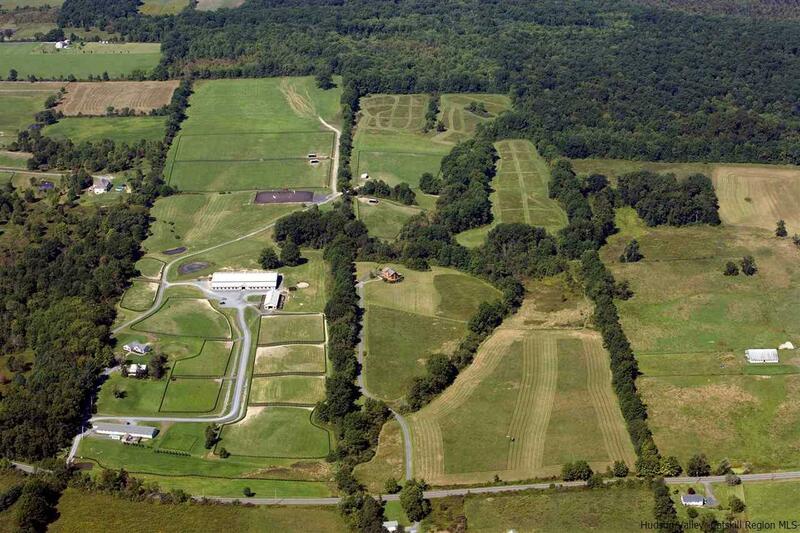 This 100 acre property set in the Shawangunk's with lovely mountain views, was fully developed as an equestrian boarding and training facility in 2006. There are two immaculate and thoughtfully designed horse barns both featuring wash stalls and tack rooms, with the larger barn containing a 81 x 197 foot indoor riding ring, with viewing room, two commercial bathrooms and farm office with a combine 26 stalls available for boarding. A 125 x 220 foot outdoor riding ring, four run in sheds and four paddocks, with ample additional acreage for hay cutting, etc. Both the indoor and outdoor riding rings feature Lawton Adams installed TravelRight â¢ footing surfaces. For the master of the hounds there are two buildings, each featuring 5 kennels, to accommodate a potential dog boarding and breeding operation as well. Additionally, an older dairy barn with private office and separate driven well, near the front of the property, offers dry storage for equipment and hay bales. The property is also a NYS DEC licensed Class A commercial shooting preserve. For the horse lover, let's discuss the beautiful home! Situated with a complete view of both horse barns from the master suite, living room and kitchen, the home was custom built in 2006 with an open floorplan between the kitchen and living/family rooms with beautiful hardwood floors; a spacious kitchen with island, custom cabinetry and ceramic tile floor and formal dining room; one can easily envision hosting family and friends for large gatherings. The home features three bedrooms, one a master with en suite bath with whirlpool tub. A half bath and washer/dryer utility closet are located off of the kitchen, and the family room features a beautiful stone fireplace with a very efficient fireplace insert. Downstairs is a huge playroom with walk out French doors to a stone patio. The lower level houses the utility room, a mud room, a built in gun safe and unfinished space for an additional bedroom or study and is fully plumbed for an additional bathroom. Additional acreage and a formal country home estate may be available as well, contact listing agent. This is a rare opportunity for a beautiful and carefully thought out stable and home complex offering several potential income streams for the new owners.